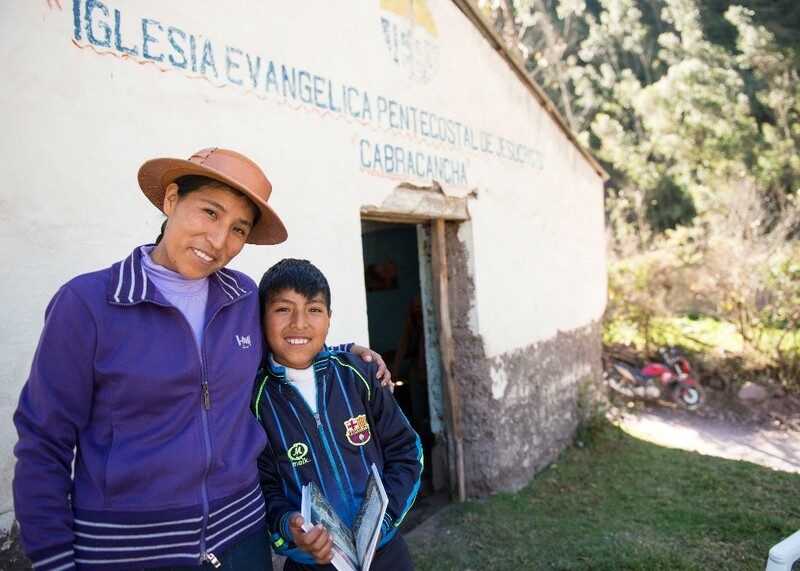 Viani stands with her son in front of her church in Peru where she helps people read and understand translated Scripture.
" For God’s Word to reach the Quechua, it has taken a large team and we thank you!" In the small village of Cabracancha nestled in the Andes Mountains of Peru, Viani Estrada listens to her son read a children’s book. Friends and family gather around, relaxing in the shade of their church building after an afternoon meal. He sounds out words in his language, Wanca Quechua, diligently working his way through the story of Noah and the ark. Some of the people, especially those in the older generation, have never been able to read Quechua and it’s a treat to hear a young person read it to them. Before Viani had the New Testament in Wanca Quechua, she tried to preach from the Spanish Bible. It was hard for everyone to understand — even Viani. But with new resources in Wanca, like the New Testament and children’s Bible storybooks, she and her congregation are excited about God’s Word like never before. Idol worship has been another major roadblock for the Wanca Quechua congregation. “But since the arrival of the Wanca New Testament, they’ve discovered that a real God exists — a God who created everything, who created them!” Viani said. Now when they’re sick, they pray to God to heal them, instead of statues of plaster or carved wood. Viani knows that transformation rarely happens in isolation. For God’s Word to reach the Quechua, it has taken a large team and we thank you! Wycliffe Bible Translators is grateful for all who take part in supporting translation and ​literacy projects like this one including those who give through the Combined Federal Campaign.